Snooper Tigre Snooper Snooper Snooper Tigre UK and European ALL Band high performance dash mounted Radar and Laser speed camera detector. Snooper Tigre speed camera detector uses Radar and Laser detection to provide alerts to live 'in-use' radar and laser mobile based devices and fixed 'live' Gatso speed camera locations across the UK and Europe*. The Tigre is designed to be windscreen or dash mounted (both mounting options are in the box) and a bright LED display and tone/voice alert provides all the warnings. The Snooper Tigre is the pefect partner for your sat nav with GPS speed camera database or if you just want to know where UK and European live 'in-use' radar/laser based devices are. Snooper Tigre has been discontinued. 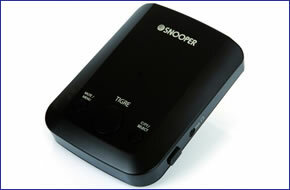 Accessories are still available for your Snooper Tigre click here. Snooper Tigre speed camera detector is one of only two detectors (the Laser Pod is the other) that we sell that doesn't rely on a GPS database either in part or in full to advise of approaching speed cameras. Instead the Tigre uses both Radar and Laser detection to provide the alerts! When coming into range (anything up to 1 mile away) of a live 'in-use' laser and/or radar Police handheld gun or fixed live Gatso speed camera the sensitive Tigre detector picks up the radar scatter or the laser beam that the speed camera emits to measure your speed. The Tigre then alerts you via its green on black LED text display and also via spoken voice alerts. Is the Tigre legal to use? Yes, the Snooper Tigre is completely legal to use in the UK, though *in some European countries it is illegal to use a radar and laser detector. We suggest if you plan to use the Tigre outside the UK, that you find out whether it is legal to use in your country. No, the Tigre only receives the radar or laser signals. Unlike a jammer it doesn't block or stop the signal going back to the equipment measuring your speed. Before 2001 if you were buying a speed camera detector, you'd be faced with a radar and laser detector as your only option. These days most systems are GPS based, and a GPS database is great for a number of reasons - the information it can provide is second to none i.e. camera speed limit, camera type, etc. Also some speed cameras such as the forward facing Truvelo and the average SPECS systems don't use radar and laser so without a GPS database these are simply undectable. However a Radar and Laser detector still has it's place and since the Tigre's launch in 2010, it has proved a popular system. For example if you'd only like to receive alerts of mobile speed camera sites (these are in the main all radar and laser based) the Tigre would be perfect. Or if you have an in-car satellite navigation device with a good GPS database, and require alerts to live 'in-use' mobile sites again the Snooper Tigre would make an ideal partner. The other good thing about a radar and laser only system is it doesn't need updating, so it's ready to use anytime and without any ongoing subscription charges! GPS and Radar/Laser combined system? Yes, it is possible to buy a system which offers the best of both Worlds - the Snooper 4ZERO Elite BT model. The 4ZERO Elite BT provides the same Radar and Laser detection as the Tigre, but in addition includes a GPS database with Truvelo and SPECS camera sites - which are undetectable to the Snooper Tigre. When you are within the range (up to 1 mile) of a live 'in use' radar or laser based system, the Tigre's screen confirms what is being detected i.e. 'K' band for a radar based system, the unit then also sounds an intermittent beep. Snooper Tigre can be installed in seconds and can be moved easily from vehicle to vehicle. Simply mount the Tigre on your vehicles windscreen with the mounting bracket provided. Power it from the cigarette lighter socket, switch it on and you're ready to go! Please note that Snooper Tigre will not work in a vehicle with a heat reflective windscreen. However there may be a gap in the coating on the screen around the rear view mirror where the Snooper Tigre can be mounted. Want to add accessories to your Snooper Tigre? We sell a vast selection of genuine Snooper parts and accessories. This product is a sophisticated electronic device which requires that you read, understand, and act upon the information given in the instruction manual (usually available via the above 'manual' link).